Let’s just go ahead and get this out of the way. Yes, Venice is a beautiful city, and so romantic… in theory. I’ve been several times between my study abroad life and going back to Europe as a real-life adult, but my last experience there with my husband, Jordan, kinda killed it for me, and definitely for Jordan. Disclosure: Some of the links below are affiliate links, meaning at no additional cost to you, I will earn a commission if you click through and make a purchase. This commission helps to keep this blog running, so thank you for your support! “You’ve gotta see it once, because it might not be there the next time we go!” - I said this to Jordan as we planned our first trip abroad together. I roll my eyes at my 24-year old self. Maybe this is true. Maybe. But we could have easily done a day trip, wiped our hands clean of this city, and not had the experience I will detail out for you. On the other hand, if you’ve gone and loved Venice, please let me know, because I’d love to know the secrets of this city that I just haven’t been able to find. I have found a few, which I will share with you, so if you have a trip planned to go to Venice, have no fear, I’ll steer you in the right direction! Hotels in Venice are crazy expensive, so we went the way of AirBnB, which we do a lot. We figured it would be slightly less expensive and we could stay in an area we wanted, versus off of the main island. As you can see from the picture, if you want to stay within the Grand Canal, you it’s still going to cost around $100/night, or more, for two people, and there aren’t too many options. I will admit that what I am about to tell you definitely skewed our opinion of Venice, but I still stand strong in my opinion considering everything else. We made peace with the cost of our accommodations and chose one based on location, alone. Upon arrival in Venice, our host told us to “get a map and find the street” in order to find our AirBnB. Normally, we would just catch a taxi and give them the address, and all would be good, but this isn’t really possible, considering Venice is made up of canals. We relied on the kindness of strangers (bonus points for Venice here) to help us find our lodging. Needless to say, it took a long time and was not a fun way to start our time in Venice. The situation did not improve from there - our room was dingy, with exposed wires, broken furniture, and perhaps the worst was that we came back one time to the window wide open. We were only there for two nights, so we put on our best happy face and tried to spend as little time in the room as possible. Don’t get pizza: wood burning ovens were outlawed in Venice many years ago, so you won’t be able to find the great Neapolitan-style pizza you will elsewhere. Try this in Naples instead! Stay away from red meat: you are in a city that’s floating in a lagoon; not much room for cows to roam. Anything with red meat in it was definitely imported, and is not Venice’s strong suit. Try to stay away from tourist traps: I know, this is easier said than done, but it can be done. Is the menu presented in five different languages? Does it look like the restaurant doesn’t have a kitchen? Is a waiter standing outside trying to get you to come in? Maybe rethink going into these places. Just to be clear, Jordan and I didn’t know any of these tips and tricks, and because we didn’t have our Skyroam yet, and our AirBnB’s WiFi didn’t work, we always looked for restaurants with WiFi. If you go to Venice, I highly suggest you go out to the Islands of Murano and Burano. Murano is known for their blown glass, and it is really incredible to see the shops and take a peek at what they are working on. You might be able to see someone working, or you can pay a little for a tour of one of their back houses. Burano is known for their lace; walking down the main square in Burano, you can see many people working on lace, which I found very charming. These islands also have very colorful buildings, and are much more peaceful than Venice - it was definitely a nice respite from all the commotion of the city. There was one catch - it was about an hour’s ride to each on the ferry (ACTV), and costs 7.50 € per person. In fact, it’s 7.50 € for a 75-minute time period on the ACTV. That means that it’s essentially 7.50 € any time you want to make use of the ACTV, which can be the most efficient way to get around the city, and it moves very slowly. We tried to avoid this at all costs, but with luggage, it was our best option getting to and from the train station. Granted, we went at probably the worst time of year, but there were tourists everywhere, and there was just no getting away. We waited for about an hour to get into San Marco, restaurants were packed, sidewalks and bridges are narrow, so it always felt like we were bumping into people. 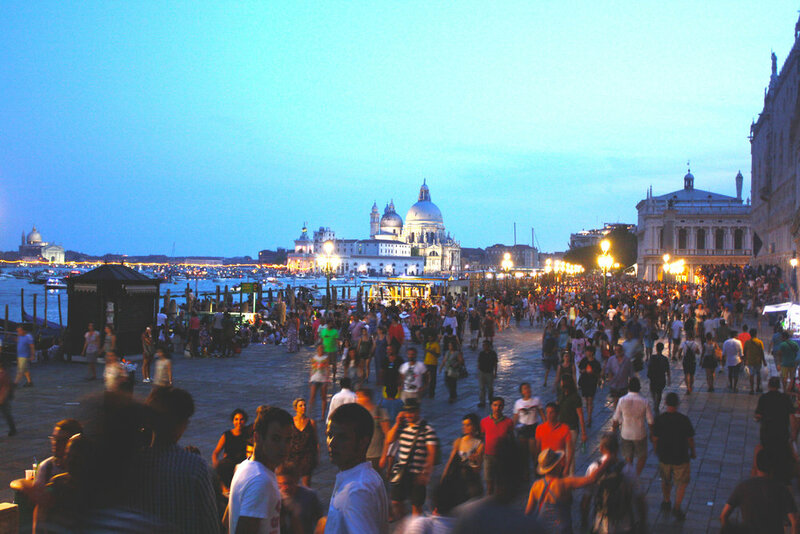 On top of the crowds, Venice can smell. Again, we were in Venice in the middle of July - probably not our smartest decision, but in that type of heat and humidity, things get pretty stinky. The two main reasons for this are 1) the diesel boats running in the Grand Canal all the time and 2) the canals are the sewage system. Yup, the canals are the sewage system - and they rely on the tides to wash the dirt out of the lagoons. Apparently this was revolutionary… in the 16th century. Not so much anymore. This also makes me question the seafood that comes from the lagoon. So, during the summer, when it gets really hot, and there’s really no breeze, the smell sticks around and is not pleasant. If you are planning a trip to Venice, I suggest you go during the Spring for many reasons. It will be warm and enjoyable, but not so warm that the wonderful odor from the canals will be too noticeable. This is also right before the major tourist season that we experienced, so hopefully you can avoid the major lines and cramped sidewalks. I’m not one for taking pictures of masses of people, so this is really the only one I had. This was taken in the evening, after the cruise ships had left, so it’s even less crowded than it normally is during the day, but you can still see how many people are there. It was incredible. Unlike any other town in Italy I’ve visited, the locals do not like the tourists. I can understand why - there are so many people in Venice that it is literally sinking, but we had some not-so-great experiences with locals. One in particular, we were sitting on a bridge fairly late at night watching gondoliers go by, and a local woman came out and started yelling at us in Italian. While I claim to speak Italian, I do not speak angry old woman Italian, and I could not understand what she was attempting to say to us. A shop owner nearby came out and (from what I understood, because “I speak Italian”) told the woman to mind her own business, as we were not disturbing anyone or anything, and go home. Jordan and I were perplexed as to what we could have done to upset her, but apparently this is something that happens frequently, according to this shop owner. People are upset that tourists are “destroying the city” and incidents like this happen here and there. All in all, Venice is a beautiful city, and I think it’s possible to do it the right way, but I think it’s also possible to see everything in one day, if you’re up for that. In my opinion, the best sight worth seeing is San Marco (really, a gorgeous cathedral), and walking around the city a bit, and that can be accomplished in a short amount of time. What was your experience in Venice? Good? Bad? Let me know in the comments! Also, make sure you like my page on Facebook for more updates! Bangkok is full of amazing temples! In this post, I’ll tell you which three are my favorite and why. Read on to find out more! Whether you’ve got one day or four, these top five highlights in Budapest are not to be missed! Read on to find out a little bit of history and what my favorite sights in Budapest were. It’s hard to say that one town is the best of them all, but we really fell in love with Corniglia. 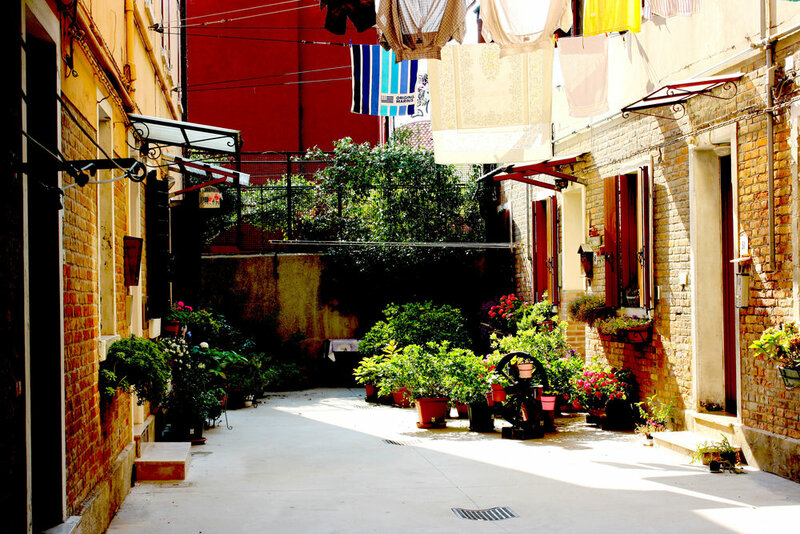 Read more to find out why we think this is the greatest village in Cinque Terre, Italy. Curious to know about the secret bakeries in Florence? I’ll tell you how to find them, and what to do once you do! Find out why we chose the travel agency Anywhere Peru, what all was included in the cost of our trip, and the pros and cons of using a travel agent, so you can decide whether or not going through a travel agency is for you!